Two Russian alpinists, Sergey Nilov and Dmitry Golovchenko, spent nearly three weeks attempting a new route in alpine-style up the unclimbed main east face of Nepal's Jannu/Kumbhakarna (7710m). After heavy snowfall and in anticipation of incoming bad weather, the climbers made the decision to retreat just below the final summit block, roughly 400 meters from the top. Though they did not reach the summit, Nilov and Golovchenko have set a new high point for a route up the direct east face of 7310 meters. Jannu lies in eastern Nepal in the Kanchenjunga Himal along the Indian border. When asked what he thought about the mountain, Chomolungma (Everest) first ascensionist Tenzing Norgay replied, "That is not a mountain, it is a ferocious giant." The steep, serac-littered east face overlooks the Yalung Glacier and has seen a number attempts. All previous attempts on the east face, according to Rodolphe Popier of the Himalayan Database, have been by the right, east side. No parties had yet attempted a route up the main east face. Slovenian expeditions attempted the right side of the face in 1991 and 1993, but bailed higher up the mountain, citing that it seemed possible under better weather conditions. On a solo attempt in 2004, Slovenian alpinist Tomaz Humar reached 7000 meters on the same portion of the route, but found the ice too delicate to continue. 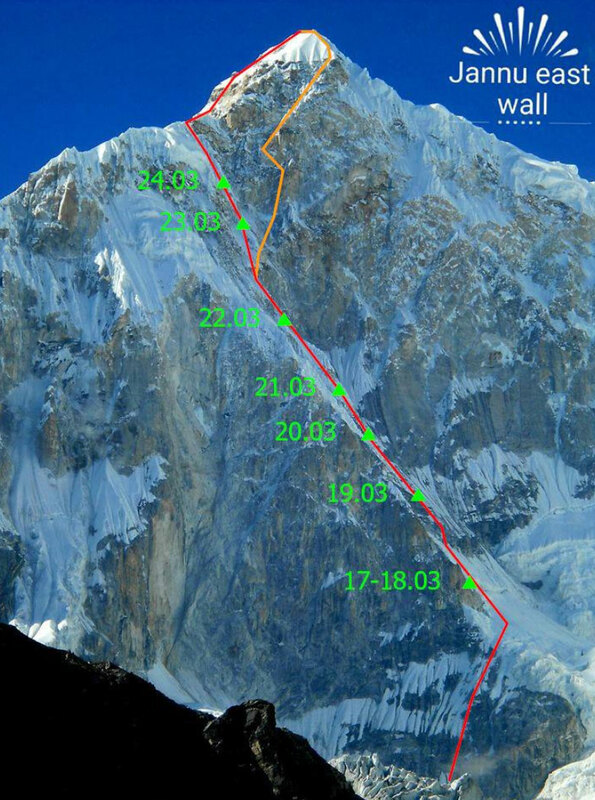 Nilov and Golovchenko aimed to climb a direct route up the main east face to the summit. Marcin Tomaszewski of Poland had originally intended to join the climbers on the mountain and accompanied them base camp, but when Nilov and Golovchenko decided to begin their ascent without a formal acclimatization period of climbing high and sleeping low, Tomaszewski elected to stay in camp. 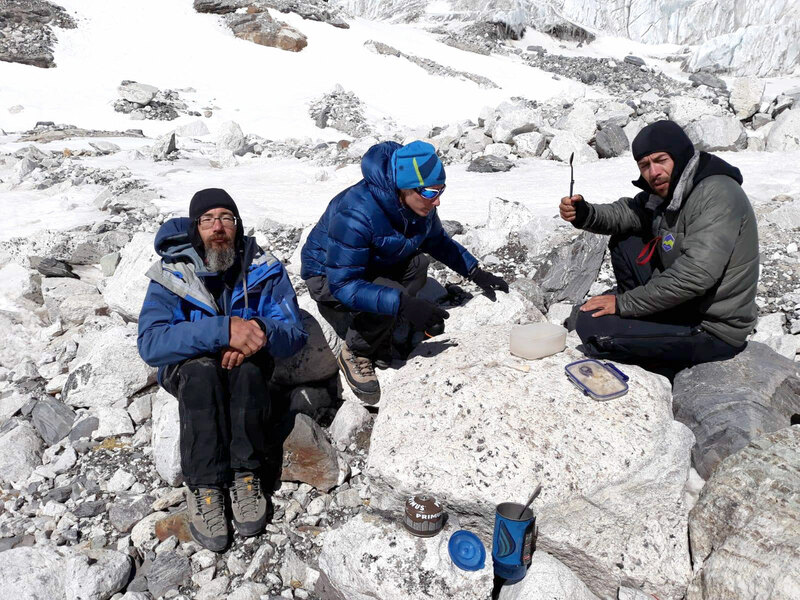 Nilov and Golovchenko left base camp on March 16 and spent their first night at 5520 meters. On March 18 heavy snow fell, and strong wind was forecasted for the coming days, but the men were able to continue up in decent weather the next day according to Mountain.RU. Due to the conditions the men chose to deviate from their planned line directly up the summit tower to an approach on the left, along the south ridge. On March 19 through March 24 they moved at a pace of about 100 to 200 meters per day. A foot and a half of snow fell on Jannu on March 26, but the following day the men were able to move a few rope lengths up to the south ridge. Anna Piunova, editor of Mountain.RU, received a message from the climbers that they'd climbed the east face, and connected with the Southeast Ridge (Desmaison-Keller-Gyalzen-Mitchung-Paragot, 1962) on the peak's south shoulder, but decided not to attempt the summit due to bad weather. The men started descending on March 28 from 7310 meters, not via their route due to concern over the serac hazard, but by the original 1962 route. Piunova received another message on March 29 that said, "It's hard," from a location at 6995 meters. The next day she got a message from 6409 meters, a point at Buffer Peak, saying that "everything is ok." The climbers made it to base camp on April 2 after spending some 18 days on the mountain. Nilov and Golovchenko are experienced alpinists who have made many first ascents together. In 2012, along with Alexander Lange, they spent seventeen days opening up a new route on Pakistan's Muztagh Tower (7284m) via the north-east spur called Think Twice (ED: 6a A2 M6, 3400m). They were awarded a Russian Golden Axe and a Piolet d'Or for the ascent. In 2016, along with Dmitry Grigoriev, Nilov and Golovchenko put up a first ascent of a route they named Moveable Feast (ED2: M7 WI5 5c A3, 1400m) on the north buttress of Thalay Sagar (6904m) in the Indian Himalaya. That route also received both a Golden Axe and a Piolet d'Or. 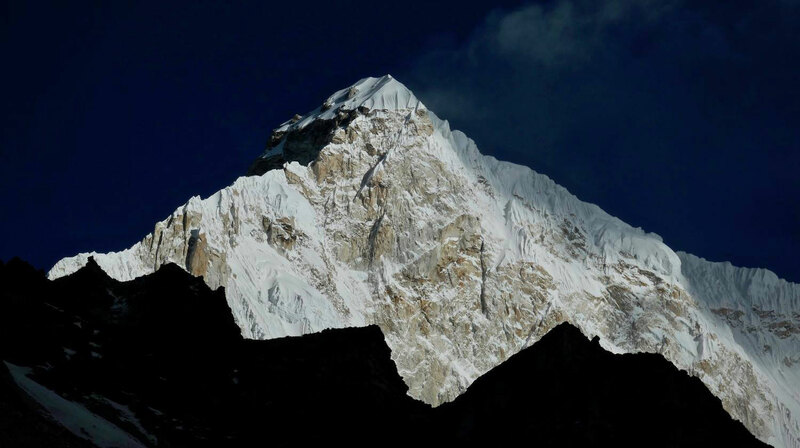 Since the first ascent of Jannu/Kumbhakarna in 1962, according to the Himalayan Database, there have been fifty-two expeditions to the peak, seventeen of which were successful and yielded sixty-five summits. For years the north face was "arguably amongst the hardest unclimbed, unattempted walls worldwide," says Popier. In 2004, a Russian expedition made the first ascent of the North Face using established portaledge camps. The North Face still has yet to be done in alpine style.